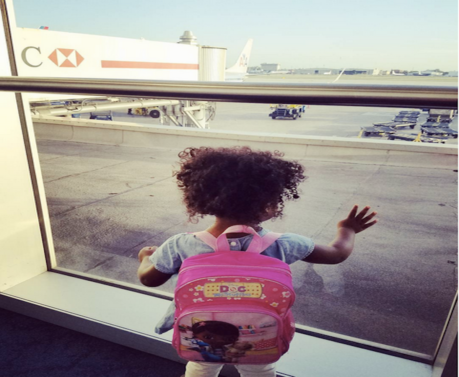 By now, I hope you have been inspired to take a trip with your kids after reading 5 Good Things You Will Experience When Traveling With Children and learned 7 Ways To Plan An Affordable Family Vacation. Now here are some basic tips on surviving your the airport with kid(s) in tow. Before you head to the ticket counter to check in make sure you have the proper documentation for your children. Domestic Flights: For unpaid lap infants you will need to carry proof of age in the form of a birth certificate, immunization records, or passport. I personally have never been asked to show it but I have seen firsthand a father, who didn’t have proof of age, denied boarding for his flight unless he paid for a seat for his daughter. Buying a ticket at the gate is no small fee so better to be safe than sorry. International Flights: All passengers regardless of age require a passport to travel internationally. If both parents or legal guardian(s) are not traveling with the child you are required to have a notarized document giving you permission to take the child out of the country alone or proof that you have sole custody. Although only required for entry to some countries, airlines, cruises, and immigration officers have the right to ask you for this documentation as they try to reduce kidnappings and human trafficking of children. Throughout our travels I have been asked for this form twice, once by Royal Caribbean and another by Delta Airlines. We’ve always gone to our bank to get the forms notarized. Although it can be a pain, I’m glad we took the precaution to get it done so we didn’t miss out on those two trips. nd a stroller at the ticket counter or at the gate, free of charge. You will also be able to bring a diaper bag on board in addition to your carry-on allowance. If you purchased a ticket for your child they will have the same luggage allowances as an adult. Airline rules vary, especially when traveling budget airlines, so be sure to check the website of the airline you’re traveling. Print a copy of what’s allowed and keep it with you in case you are challenged by an uninformed gate agent or flight attendant.